Today I say good-bye to the Great Impressions Design Team. I have had a great time getting inky with them! My year on the team is over, and I want to thank them for having me as part of their family! So let's grab our oaties, a big sip of milk, and off we go on our last Jammie Day! Today I am making my very first Christmas card of the year! Oh my-I better get with it...and you had to know I would have to use an image with the meeces! Gotta love 'em! This sentiment is a perfect fit for this snowman and Christmas light paper, don't you think? Thanks to Molly and Deone for keeping me going at Great Impressions and to Jenny for being such a great team leader! This is not goodbye for me, you will still see many Great Impressions creations coming from my blog! Thanks for stopping in to say Hello today-I always look forward to your visits! almost from the beginning of our on-line store opening. I thoroughly enjoyed watching them grow as designers and I know great things are in store for them in craft land! I will miss you ladies and consider you both part of the Great Impressions Stamps family! Please come back and visit often, you are always welcome! We have some new designers to greet today too! 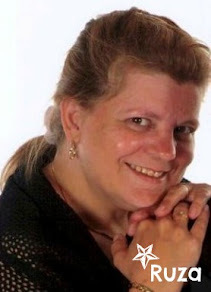 I'm thrilled to have Giovana, Mynnette and Mary Anne join us! They will start their terms with us beginning this Monday. I know you will adore the unique and delightful styles they bring to the mix. I created my card today for all of the Design Team. You ladies are the best and I am blessed to work with you! Happy Friday and thanks for taking the time to visit the Great Impressions Blog. I read some statistics recently that the summer months are the top months for births in the U.S. August, June and July is the ranking. With those odds, I am sure to be invited to a baby shower. So, I decided to make a baby card to post today. 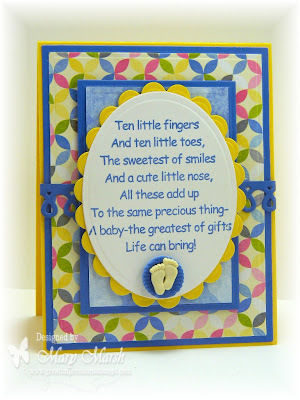 I just love this sweet sentiment stamp - "ten little fingers G49" from Great Impressions Stamps. It could be used for either a boy or girl. My card is using bright colors so I think it could go either way as well. I had these cute baby feet in my stash. I used a glue dot to place them on a blue corduroy button. On another note, this post is my last as a Great Impressions Design Team member. My time on the team went by so quickly and I have thoroughly enjoyed it. 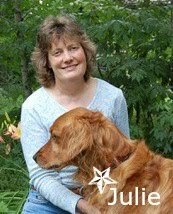 Jenny (our DT coordinator) and Deone (GI owner) have been so wonderful. So thank you both for the opportunity to work with these fabulous stamps. Have a great weekend everyone. Hope you have some fun summertime plans. Hello Great Impressions Stamps Friends!! 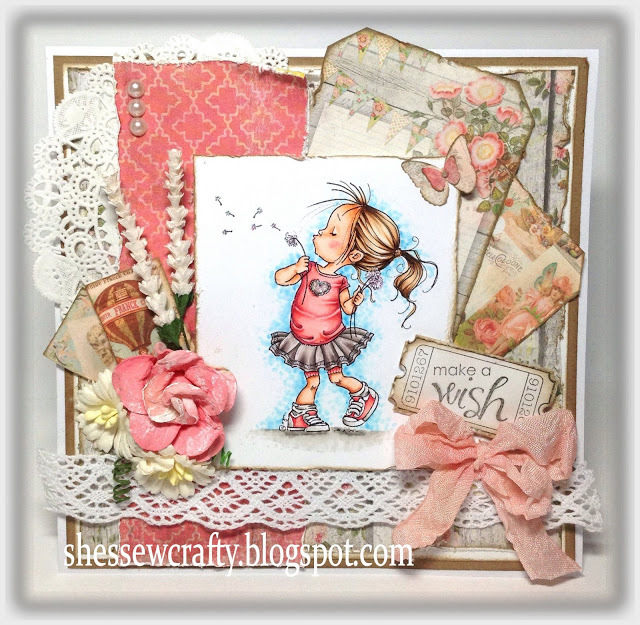 Kendra, from Luv 2 Scrap n' Make Cards, here today as a guest designer!! I am so super excited!! I live in Northeast WI, with my high school sweetheart and two little kids, who keep me very busy! When I'm not spending time with them or working in my flower beds, I love to be in my craft room!! I have been crafting for about 13 years now, as my husband and I both raced at a local racetrack and I wanted to scrapbook all of our wins and memories! From that it became a HUGE addiction! About 6 years ago I began creating all my own cards! (I can't believe it's been 6 yrs since I bought a card! WOW!) I get such a huge joy out of each of my creations! 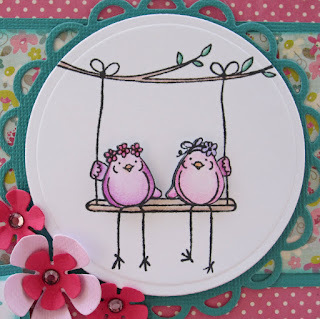 For my card today I used the adorable Stamp of The Month "Birdies on a Swing"! Along with the sweet "A Friend" sentiment! With the "A Friend" sentiment, I decided to mask that stamp when inking it up, as I wanted the "Everything" to stand out and be highlighted! And one last close-up of the adorable birdies!! Thanks for having me as a guest designer!! I am so overjoyed!! 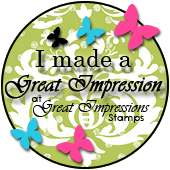 Be sure to check out all of the wonderful Great Impression Stamps here! Love is in Bloom here are at Great Impressions with this adorable Love is in Bloom Giraffe stamp. I stamped it onto a scallop tag and used my Prismacolor pencils and Copics to color it. 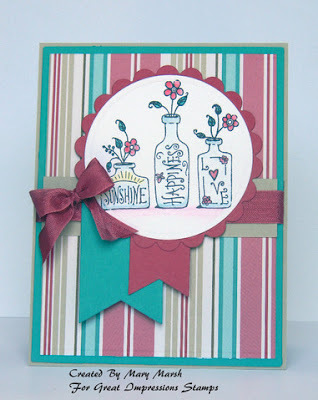 I then added a die from Spellbinders and used it behind the tag. I thought this paper from DCWV that had the flowers blooming was perfect and matched the sentiment so well. Blooming flowers - Blooming love right hmm.. 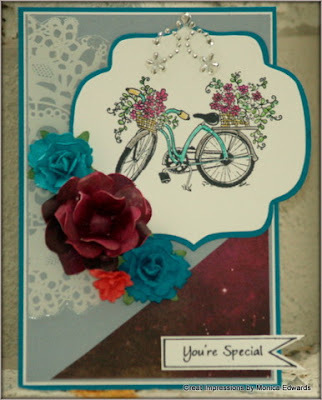 Thanks for stopping by and be sure to join in on our challenges we love to see your projects using GI stamps! A couple of new stamps from Great Impressions caught my eye this month and I pulled one of them out for today's card: Homes. I did some paper piecing with 6x6 paper pads by Echo Park (also available in the Great Impressions shop!) for the houses for something different. I die cut the clouds and sun from a couple of PTI dies and adhered them to the top of my card. The sentiment was added last with letter stickers and my typewriter. 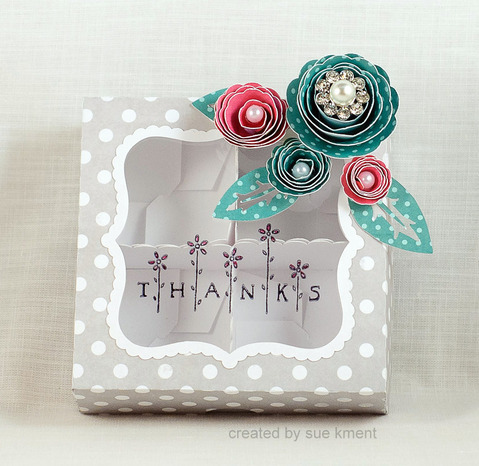 Have you tried paper piecing on a card? Line art stamps are perfect for this technique! And 6x6 paper pads make it really easy to coordinate patterns. Don't forget to check out this month's challenge! You can find all the info here. Know What's Nice About a Friend Like You?-Everything! Hello my Great Impressions Friends! My Jammie Day Sundays are winding to a close, but I still have two oaties/jammie/robe/ slipper days to go! Today I am using Birdies On a Swing and A Friend all framed by a pretty swirly frame I cut with my Silhouette. Don't you love these chicks in their matchy matchy colors? I think they color coordinated their feathers with the heidi grace designer paper! 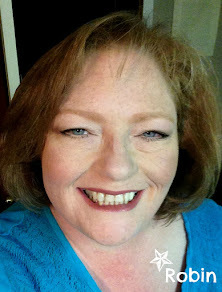 Happy Saturday and thanks for taking the time to visit the Great Impressions Blog. It's official, summer has arrived. I am so looking forward to long, warm sunny days. Also this weekend the biggest, brightest full moon of the season will be shining in the summer evening sky. Hope the weather cooperates where you are to be able to take a peek at something we sometimes take for granted. Now onto my card for today. 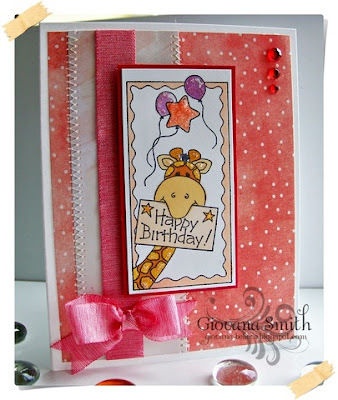 I am using a new image and sentiment from Great Impressions Stamps. 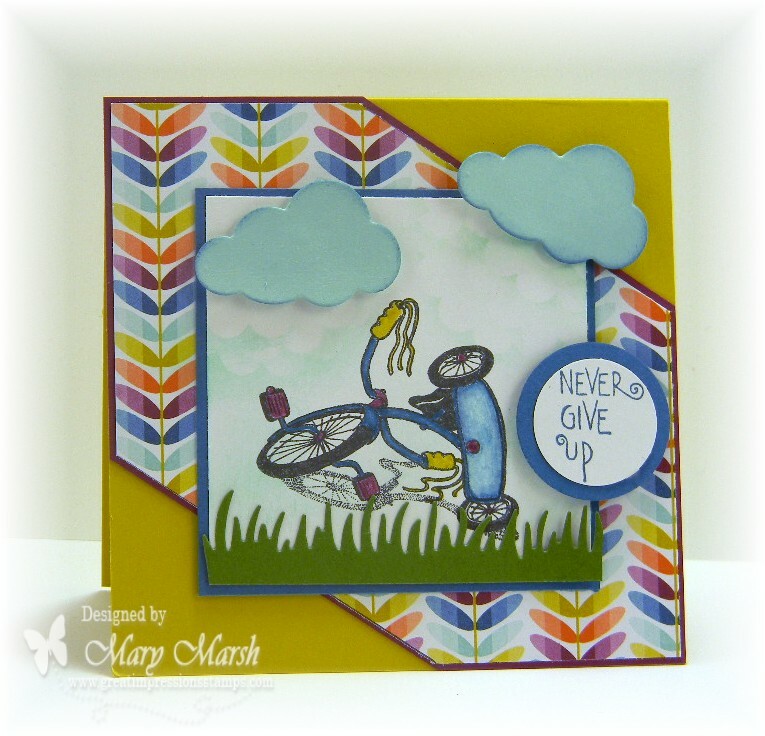 The image is "tricycle E795" and the sentiment is "never give up A145". I think both the image and sentiment combined make for a great card to encourage someone who needs a lift. I created a little mini scene by adding some die cut clouds and grass. I also sponged in some background clouds. I colored the image with markers. That's it for me for this post. I will be back again next Friday. Don't forget that our online sale is still going on. It 's a chance to get 20% off and free shipping. You can get this cute tricycle and sentiment. Shop here. Hi everyone growing up I thought pink was the most hideous color in the world. I was never the girly girl type I was always following my brothers climbing trees lol, but now pink is my color. So today I created a card sharing my love of Pink! 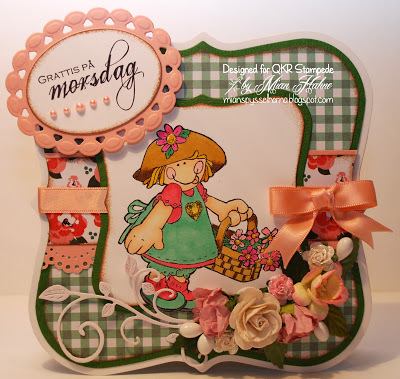 I used Great Impression Sweet Hedgehog, a spellbinder die, a handmade ric rac flower using May Arts ribbon and if interested my tutorial can be found here. I then inked the edges of my Spellbinder die in pink too. I hope everyone enjoyed my post and thanks for stopping by Great Impression Stamps! I hope everyone is having a good week. Last night I whipped up a fun birthday card using three Great Impressions stamps: Polka Dots, Wildflower Silhouette, and Tags. 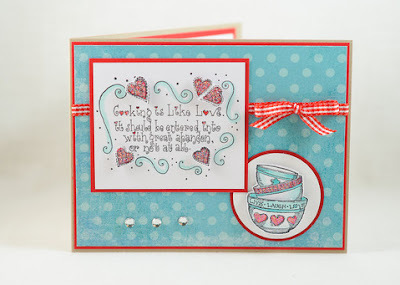 I love layering stamps, which is what I did on the white die cut. 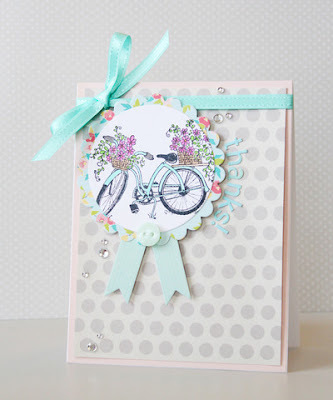 I stamped the Polka Dot stamp with Stampin' Up's Pink Pirouette ink, then layered Wildflower Silhouette on top with Pink Lemonade ink by Impress. 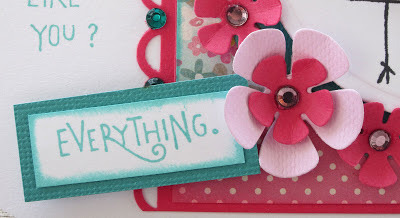 I carefully inked the Enjoy the Day sentiment with black ink before stamping it onto my tag. Wishing You Tons of Happy Days!!! Welcome to Jammie Day Sunday! Today I went very clean and simple-these stamps seem to take very few embellies to make them shine, don't you think? These are new release stamps from Great Impressions. My crafty friend Deloris has been rockin' tur-ker-roiz cards lately and I could not get them out of my head. 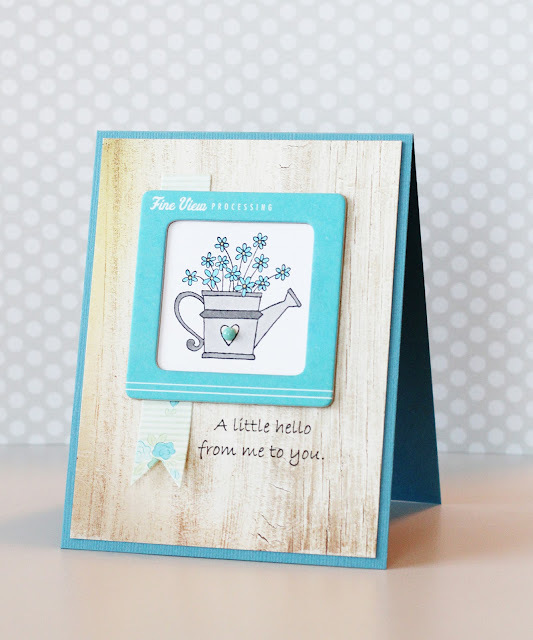 Seems turquoise and white is such crisp and clean combo! I opened my new pack of Simple Stories SN@P! color vibe papers (yes, I have been saving them for a special occassion card-but aren't they all? )...so here we go! 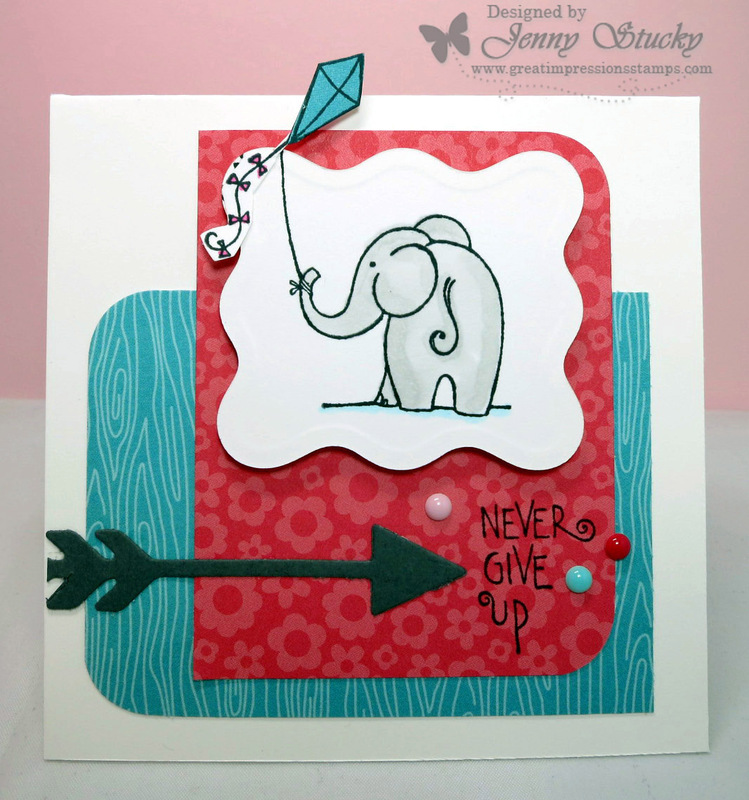 The little kite and elephant are added on with pop dots to add a little extra dimension. I cut the half banner for the sentiment with my Silhouette. Added a little twine with a bow and added the completed panel onto the card base with dimensionals. 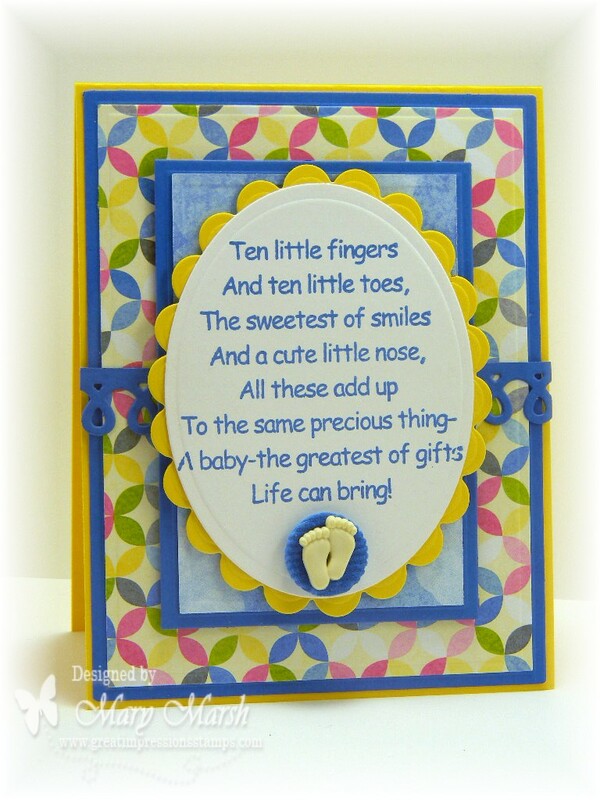 I think this is one of my favorite Great Impressions card...although I think that of every card I make. My time on the design team is coming to an end-June 30th will be my last posting for the team, but certainly not my last Great Impression's cards...so let's not be sad! Right now there is a sale going on at Great Impressions-20% off and free shipping in the US with a $25 order. A great deal! 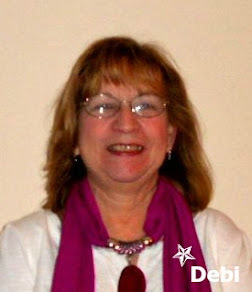 Our June challenge is Leave A Little Sparkle-don't miss it!!! Sorry for being so chatty today-just wanted to say thanks for stopping in to say Hello-We always look forward to your visits! Happy Friday and thanks for taking the time to visit the Great Impressions Blog. We are celebrating Father's Day this coming Sunday. 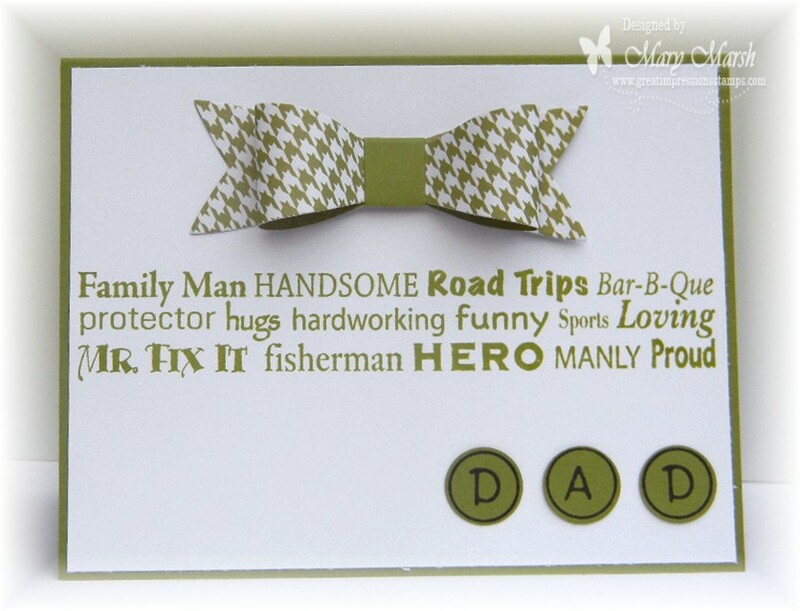 So in honor of that event I created a card to honor the Dad's out there. My card is using 2 Great Impressions Stamps. The sentiment is "all about men"- G266 and I stamped in olive ink. The word "Dad" is from the "circle framed alphabet stamp- K83". 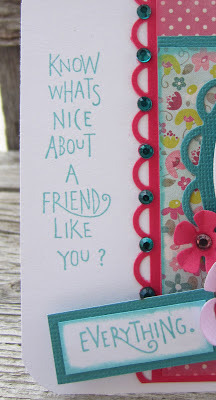 I stamped in black ink on olive card stock and used a circle punch to punch out the letters. I made the bow tie with a die that is designed for paper bows. I like how it turned out. I saw the idea on Pinterest. I don't usually make cas cards, but I think this one is perfect for the right guy. I will be giving this to a friend of ours who fits the bill. Well that's it for me for this week. So until next time........inky hugs. As you know, Great Impressions Stamps is the sponsor this week at The Play Date Cafe! We thought it would be fun to do a little give away of our own. Karon Hughes will be finding some delightful Twinery Twine in her mailbox soon. Congrats Karon! Hello to you all this morning! I am here to share this fun 3D card-reminds me of a diorama card. I love the dimension! This poor kitty is hanging on for dear life...off an Oregon cherry tree LOL! I cut out the 3d card, tree, grass and banner with my Silhouette. I extended the length of the branch with a copic multi-liner so that it would be long enough to reach the full width of the window and a wee bit more so that I could tape it to the inside of the card. To finish it off I added the scenery and sentiment banner. Done! Don't miss our June challenge --- Leave A Little Sparkle. Happy Friday and thanks for taking the time to visit the Great Impressions Blog. Another summer weekend is here so I hope the weather is cooperating wherever you are. If it's rainy, that's a perfect reason to stay indoors and do some crafting. 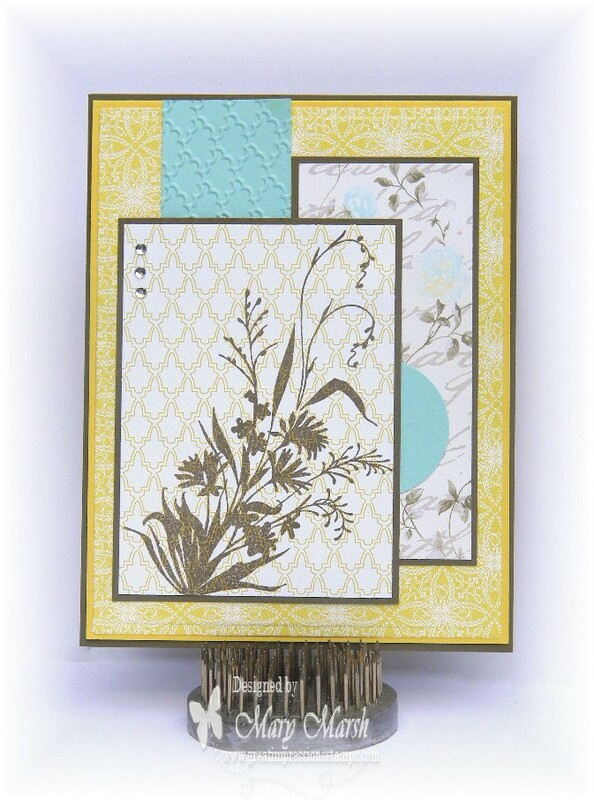 My card for today is using the Great Impressions Stamps "wildflower silhouette"- H184. It is available in the online store. I stamped the image in soft suede ink directly onto patterned paper. I love the look of doing that. My card colors are soft suede, daffodil delight and pool party. I used coordinating patterned papers. A couple of reminders: There is a 20% off and free shipping in our online store. 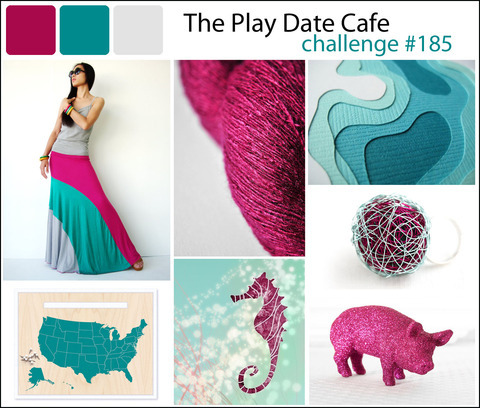 We also are sponsoring the Play Date Café Challenge this week and giving away a little blog candy. See this post for more details. Well, that's it for me for this week. So until next Friday..........inky hugs. 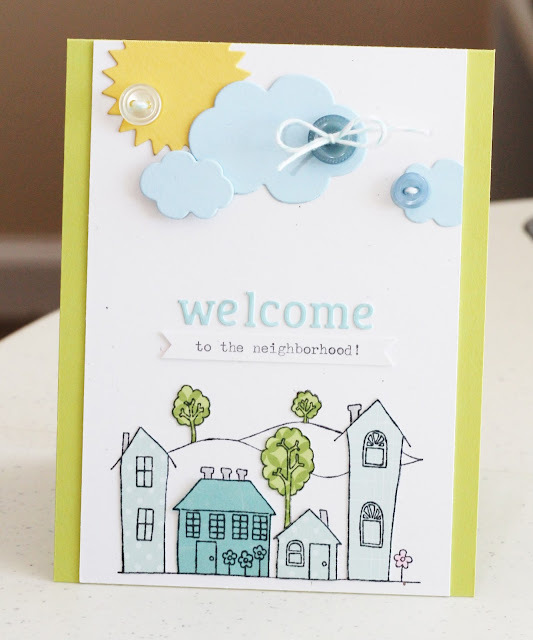 Great Impressions Stamps and The Play Date Cafe with BLOG CANDY! We have a treat for you today! 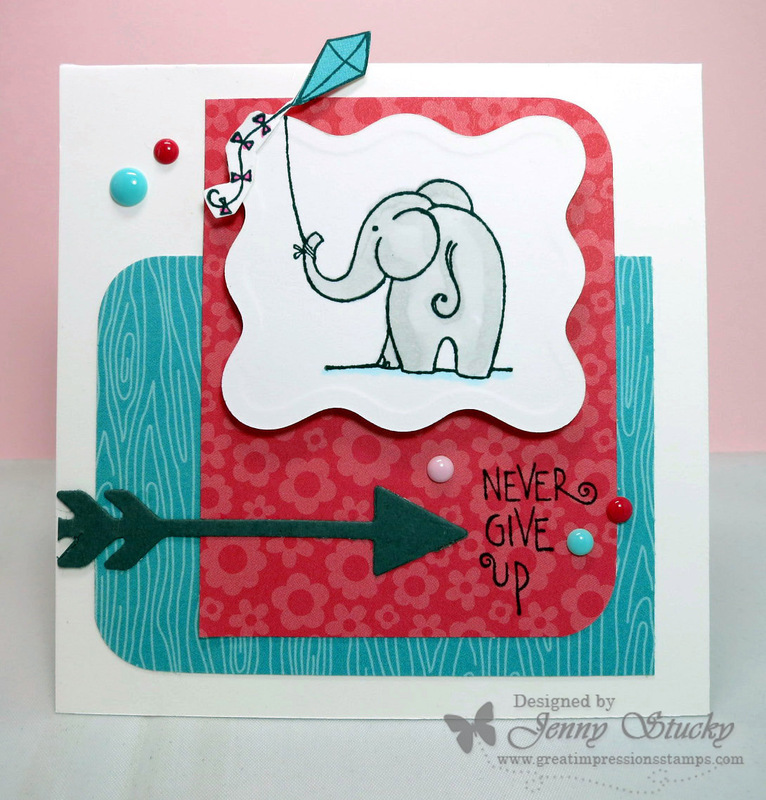 are using our newest stamp release on their challenge projects. I just know they will inspire you to play along! We thought it would be fun if our Design Team played along right here. Let's see what the team came up with, shall we? 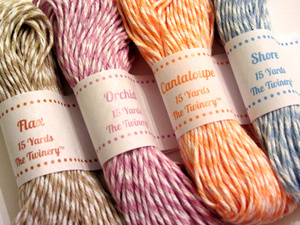 colorful twine to share with you crafty peeps! All you have to do is check out the The Play Date Cafe Design Team cards and come back here and tell us your favorite two Great Impressions Stamps for your chance to play with some new twine! The Great Impressions Stamps sale is still going strong, so if you see something you like now is the time to shop! Wishing everyone a very crafty day! Well here we are again on another Wednesday just a few more days until the weekend. Right now the weather here in Florida has been rainy and humid but I always try and remember things could be so much worse. So my post for today is about enjoying all life has to offer, being carefree and enjoying every moment. I created this Hop tag and the GI Hot Air Balloon went perfect. I added a Hope chipboard sentiment painted it with some gesso and used some Memento ink, added some Prima flowers and a butterfly. I thought all the elements were perfect in represeting being free especially the balloon, which is on my bucket list of to do's before I meet my maker lol. I hope everyone enjoyed my post. 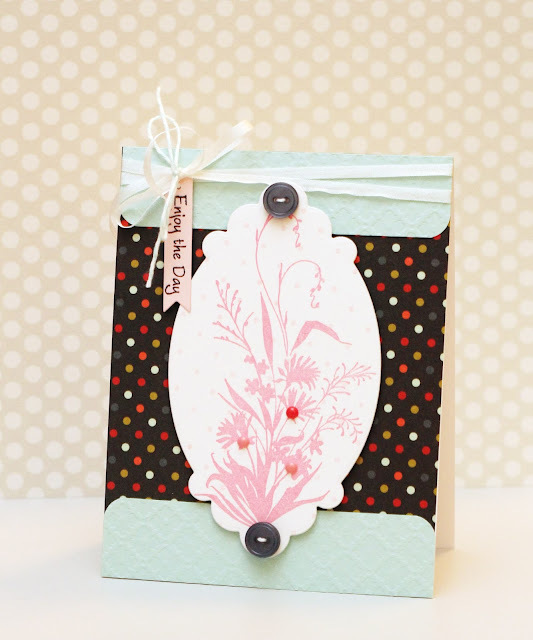 I love making my own backgrounds with stamps, and the new scalloped flower stamp is perfect for this technique! I used a light pink ink, so the background is subtle, but it matches the patterned paper perfectly. 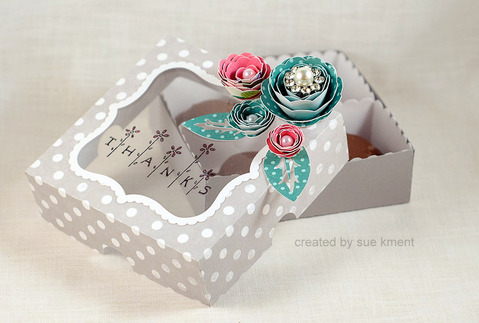 I also used a couple of different Silhouette shapes to accent the card (the "thanks" sentiment" and flowers). 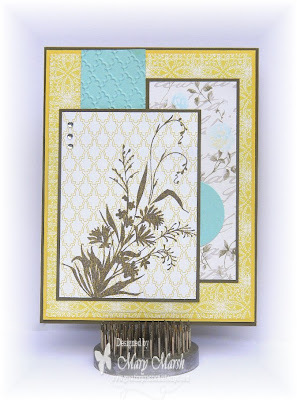 I love mixing and matching different stamps, papers, and die cuts. So many possibilities! And don't forget, our June Challenge started on Sunday! Our Newest Stamp Release is Available Now! I just had to pop in and share today. Just take a look at our newest stamps! All of these lovelies are available to order today. you can stock up on your favorites! June Challenge and our Top Pix! Hello, and welcome to our June Challenge. If you are new to our blog we are so happy you found us! a coupon code worth $20 to spend on anything in our store! Last month our challenge theme was "Celebrations" and wow did you all have alot to celebrate! Choosing our Top Pix is getting harder and harder every month. DT members Erin and Monica are on tap this month to help me narrow it down. Erin choose #14 Leslie as her Top Pix. 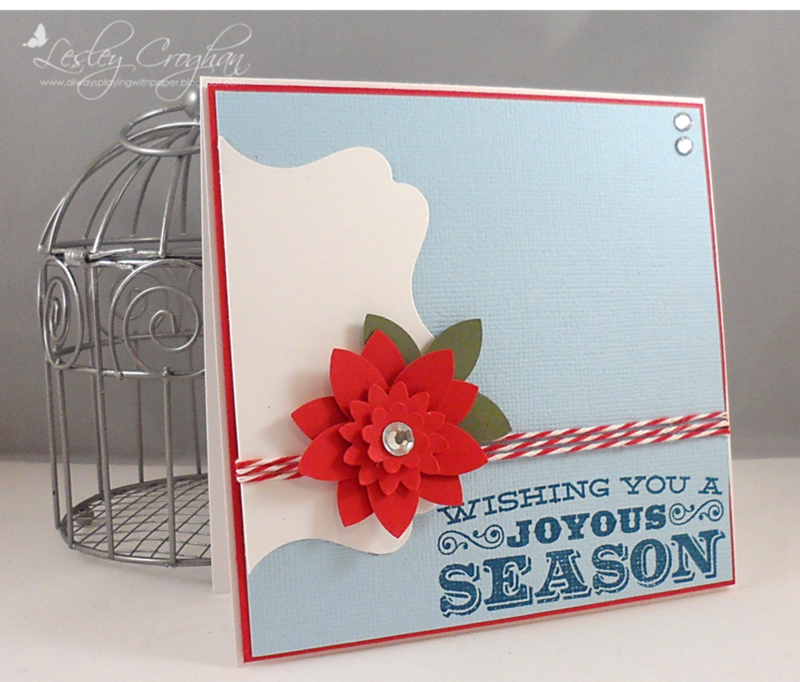 Erin said, "I love creating Christmas cards all year long, and your card Leslie is perfection! 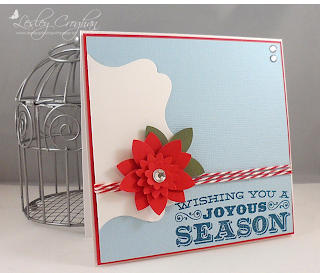 I love the poinsettia and the fresh blue/white/red color combo. Beautiful card! to brighten someones day! All the added elements make it pop even more! Danielle, if I could color like you, I would be celebrating too!! 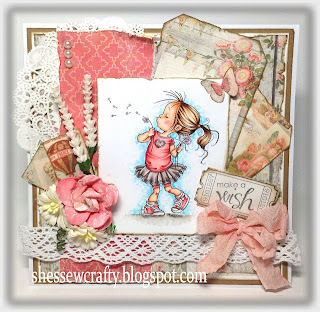 Love your card design and fabulous shabby style. Congrats on being my Top Pix! You have earned this badge to proudly display on your sidebars! And now for our Random Draw Winner! We are sending you shopping my friend! Speaking of shopping, don't forget we have a tremendous sale going on right now. 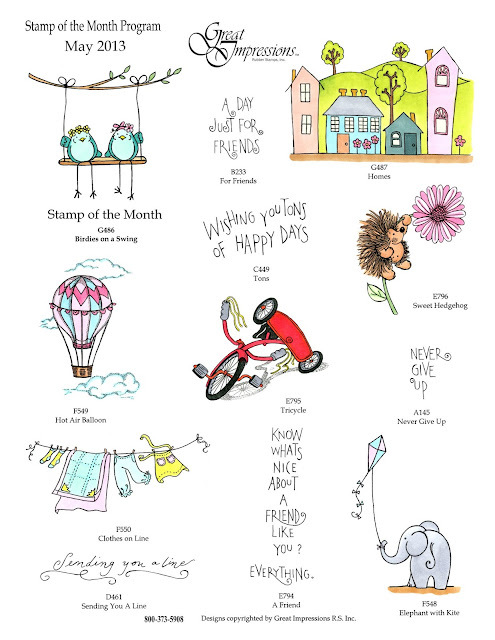 Perfect time to stock up on stamps, paper, paint, embellies and much more! Just hop on over to our store for the coupon code! Is everyone ready for our June Challenge? Our theme this month is..."Leave a Little Sparkle". We want to see a little (or big) splash of sparkle on your card or project. The Design Team has come up with some amazing cards to jump start your mojo! Love it if you stopped and gave them a visit. You can also find their work on our Facebook page. Come on over and "Like" us to take part in our give aways and stay updated. You have a month to let your sparkle shine through. Have fun with the challenge and enjoy the sunshine as we head into summer.